3140-3150-3160 Sani-Ceptor Floor and Indirect Waste Drains - Jay R. Smith MFG Co.
Used in kitchens, hospitals, food markets, restaurants, schools and all types of food handling areas where the ultimate in sanitation is desirable and a medium capacity receptor is required. Cast Iron Flanged Receptor with Seepage Holes, Acid Resistant Coated Interior, Nickel Bronze Rim and Secured Grate. Aluminum Dome Bottom Strainer or Sediment Bucket as Indicated by Figure Number. Smith No. 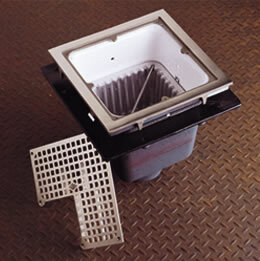 3161 (-19) cast iron 12 1/2” square, 10” deep receptor with acid resistant coated interior and nickel bronze rim and hinged top grate with stainless steel 1/4” mesh lined slotted aluminum sediment bucket. Flashing clamp in membrane floors (specify suffix –FC). Smith No. 3150 (-18) cast iron 12 1/2” square, 8” deep receptor with acid resistant coated interior and nickel bronze rim and angle top grate with aluminum dome bottom strainer. Flashing clamp in membrane floors. Smith No. 3150 cast iron 12 1/2” square, 8” deep receptor with acid resistant coated interior and nickel bronze rim and top grate. Aluminum dome bottom strainer. Smith No. 3150 (-12) for half grate or Smith No. 3150 (-13) for three-quarter grate. Flashing clamp in membrane floors. Smith No. 3150 (-10) cast iron 12” square, 8” deep open top receptor with acid resistant coated interior and aluminum dome bottom strainer. Flashing clamp in membrane floors.